Can Congress fix 'shameful' military death benefit lapse? (Left to right) Pfc. Cody J. Patterson, Sgt. 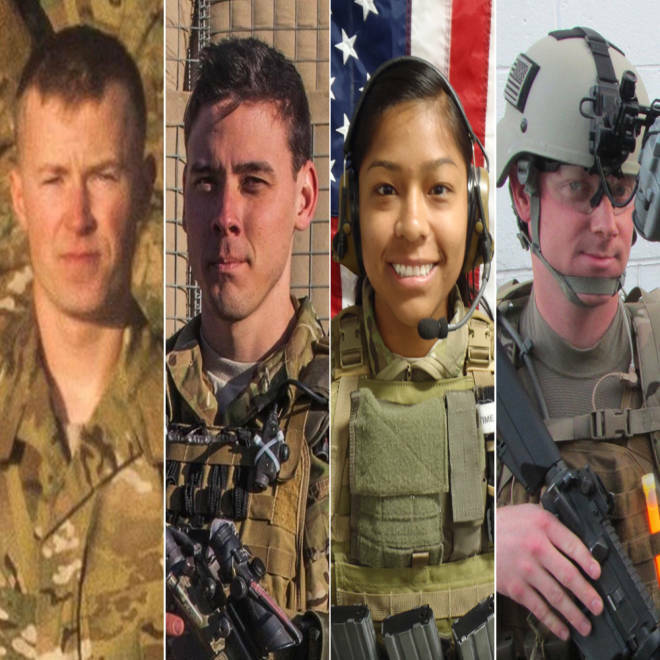 Patrick C. Hawkins, 1st Lt. Jennifer M. Moreno and Special Agent Joseph M. Peters were killed by an improvised explosive device in Afghanistan on Sunday. There is clear outrage from both parties over halted payments to the grieving families of fallen servicemen and women, but how soon can the problem get fixed? Republican House Speaker John Boehner said that the lower chamber would “act specifically on this” issue Wednesday, signaling that a possible solution has begun working its way through Congress. And in the Senate, lawmakers from both sides of the aisle voiced anger in the wake of a series of NBC News reports over the past two days, beginning with an Andrea Mitchell report on TODAY, detailing the military’s delay of the $100,000 “death gratuities” designed to assist with funeral and travel costs until after the shutdown ends. House Speaker John Boehner said the votes aren't there to approve a spending bill, but according to NBC's Chuck Todd, there are more than enough votes – provided the bill doesn't have any amendments, such as health care. Democratic Senate Majority Leader Harry Reid called it “shameful and embarrassing.” And Arizona Republican Sen. John McCain told his colleagues that they should feel ashamed. The most likely solution would simply entail changing a few words of existing legislation that currently guarantees pay to members of the U.S. military during the government shutdown. Both the House and the Senate would need to pass it, and from there it would go to the president’s desk. There seems to be momentum for that solution, and it could easily happen as soon as Wednesday, but it would break the pattern of the past few weeks. The Senate, so far, has declined to take up more than half a dozen “piecemeal” measures that would provide funding for popular items like national parks, veterans’ services, retroactive pay for furloughed workers, and support for the National Institutes of Health. But it’s likely this measure will be viewed differently, considering that it would fix a problem most lawmakers assumed they had already addressed. The “Pay Our Military Act” – which guaranteed paychecks for members of the military during the shutdown – easily passed both houses of Congress before the shutdown began. That bill appropriated “such sums as are necessary to provide pay and allowances to members of the Armed Forces” as well as money for some civilian personnel and contractors considered essential to the support of soldiers. The bill’s drafters say it was intended to cover survivor benefits as well. But after reviewing the law, the Defense Department concluded that it cannot send payments to affected families because the law did not specifically grant them the authority to pay anyone other than the service members themselves. That legal determination, one official said, was ultimately made by inter-agency legal counsel – meaning Department of Defense, Department of Justice and White House lawyers. On Tuesday, Boehner argued that the “Pay Our Military Act” gave “broad authority to the Department of Defense to pay all kinds of bills, including” the death benefits issue. The sentiment was echoed by Rep. Buck McKeon, R-Calif., the chairman of the House Armed Services Committee. "Judging by the Department of Defense's own summary of those programs, we believed that 'death gratuities' would continue to go to the families of those heroes who made the ultimate sacrifice. Without question, that was our clear intent." The government shutdown includes a suspension of death benefits that would have helped pay expenses for grieving families of fallen soldiers. Gayle Lemmon from the Council on Foreign Relations joins Andrea Mitchell. But Defense Department lawyers say they don’t think they have the legal authority to make the payments until Congress amends the “Pay Our Military Act” or passes some other kind of appropriation for the death gratuity – or until the shutdown ends. Joyce Raezer, the executive director of the nonprofit National Military Family Association, says that the withholding of the payments sends entirely the wrong message to Americans. “This is not the right message to send to our families of service members who have died, whether they’re killed in Afghanistan, or they’re killed in a training accident, or they die of cancer while on active duty – whatever the reason for the death while they are serving, that family is entitled to this payment and now the Department of Defense is saying ‘we can’t pay it,’” she said. While the withholding of the benefits certainly seems shocking, it’s not surprising to close watchers of the Pentagon. A top official told the press a few days before the shutdown that the death gratuities would be delayed. NBC's Tom Curry, Courtney Kube and Kasie Hunt contributed to this report.